Those who follow my blog will have an idea of the sort of struggles I have had recently with joint pain. Being a member of Nuffield Heath has been of tremendous benefit to me because I have been able to receive advice. Thanks to the instructors at the gym I have been able to try to address these difficulties. With a set of exercises designed to strengthen my core, I have worked hard to solve the problem. I have been experiencing difficulty in walking for a while and particularly while coming down a mountain. Most painful have been my hips and lower back and unfortunately this has been enough to stop me from walking. Explaining this to my gym instructor he suggested a range of stretches and exercises using a TRX. I hadn’t heard of this before but now I have been converted! The TRX is simply two pieces of cord that attach over head and used to support your weight and balance. There is a handle on each cord for holding on and adjusters for easily changing the length. When I started using the TRX I learned some basic squats and stretches. By doing lunges I am extending and trenching all my leg muscles which I find so helpful. When you have cerebral palsy as I do, sometimes muscles can feel knotted up, tight and tense. Being able to stretch in this way is a fantastic feeling. I’ve not been up on the hills yet to see if if has made a difference but I am really enjoying using it. I was so impressed with the TRX I went out and bought one. I would have bought the whole company but couldn’t afford it! 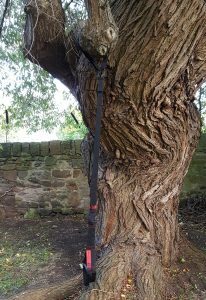 Now I can can attach it to a tree in the back garden and exercise to me heart’s content. When I’m done, it folds up neatly into a small bag for easy storage. What’s not to like? There are endless amounts of exercises you can do with it, just check it out YouTube.